Linear Acoustic has been involved in projects with Dolby Laboratories, Sirius Satellite Radio, Microsoft, all major terrestrial networks, multiple local stations, HBO, Viacom, Disney, Miramax, Sony Studios, and others. It is also actively involved in ATSC, NRSC and other industry organizations, as well as being members of the AES, IEEE and SMPTE. 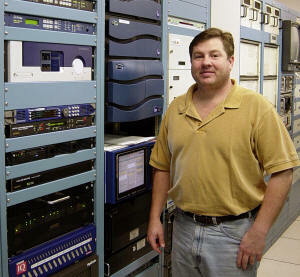 our DTV stations" - Steve Smith, VP of Engineering/Technology. Lancaster, PA: Linear Acoustic has supplied a total of 16 OCTiMAX 5.1 Digital Television Audio Processors to Liberty Corporation for installation at the company's TV stations around the country. All systems are currently on-air providing multichannel audio from two-channel material, or handling 5.1 pass-through from network feeds. "OCTiMAX also provides full level control and dialog adjustment for our DTV stations," confides Steve Smith, VP of Engineering/Technology for Liberty Corporation. "We had analyzed and tested many analog devices including multiband processors," Smith continues. "We have never found any digital audio processing equipment that could perform in both stereo-to-5.1 and original 5.1 HD TV audio applications until we discovered OCTiMAX. The resultant on-air audio from OCTiMAX is extremely realistic. The OCTiMAX even makes poor-sounding incoming 5.1 audio a pleasing experience." The OCTiMAX 5.1 Digital Television Audio Processor combines multichannel, multiband dynamic processing with audio metadata functionality and local audio insertion capability. An Auto Voiceover(tm) feature allows straightforward insertion of voiceover audio, while an integral UpMax(tm) 5.1 Channel Surround-Field Synthesizer produces 5.1-channel audio from a standard two-channel mix, with full control of center width and surround depth. The resulting signal is fully mono, stereo and matrix surround compatible. "The voiceover mode is very useful," Smith asserts. "There is nothing more annoying for a DTV audience than not being able to hear the central dialog channel in a stereo or 5.1-channel delivery. No other device we investigated offered such an easy-to-implement solution." "The Linear Acoustic OCTiMAX 5.1 produces a clean, consistent and appropriately dynamic audio signal that is perfect for Dolby Digital AC-3, MPEG, or Windows Media encoding and transmission," considers Linear Acoustic president and founder, Tim Carroll. OCTiMAX 5.1 also generates an Lt-Rt-compatible stereo downmix of the main program that can be used to feed legacy two-channel systems. The processing structures support eight mono programs, a 5.1 + 2 channel program and any format in between. "The proprietary processing structure combines a two-band AGC with five bands of compression, look-ahead and peak limiting for each channel of audio," Carroll adds. Advanced multiband source noise reduction is available to improve the sound of legacy films and older television programs. Linear Acoustic also offers a companion unit, UpMAX(tm) 2251 5.1 Channel Surround-Field Synthesizer, which produces 5.1-channel audio from a standard two-channel mix, with full control of center width and surround depth; in essence it is equivalent to the OCTiMAX 5.1 Digital Television Audio Processor, but without the dynamic range processing. As such, it is more applicable to production environments where the 5.1-channel output will be incorporated with other program sources prior to final broadcast processing. Chris Knechtel, a consultant to Liberty Corporation, pictured next to WTOL's Linx Electronics QuickLinx DTV rack at Liberty's WTOL-HD, Toledo, Ohio. QuickLinx is a TV conversion solution that includes the Linear Acoustic OCTiMAX 5.1 Digital Television Audio Processor as well as TVLinx PSIP generation and all audio and video encoding. The OCTiMAX 5.1 combines multichannel, multiband dynamic processing with a stereo-to-5.1-channel up-mixer. Linear Acoustic has been involved in projects with Dolby Laboratories, Sirius Satellite Radio, Microsoft, all major terrestrial networks, multiple local stations, HBO, Viacom (Showtime, MTV, etc. ), Disney, Miramax, Sony Studios, and others. It is also actively involved in the ATSC, the NRSC and other industry organizations, as well as being members of the AES, IEEE and a sustaining member of the Society of Motion Picture and Television Engineers.